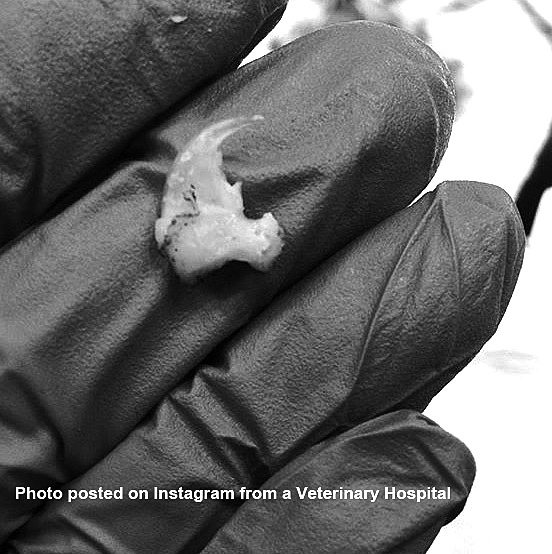 Most vets find ear cropping and debarking to be unethical and wrong. 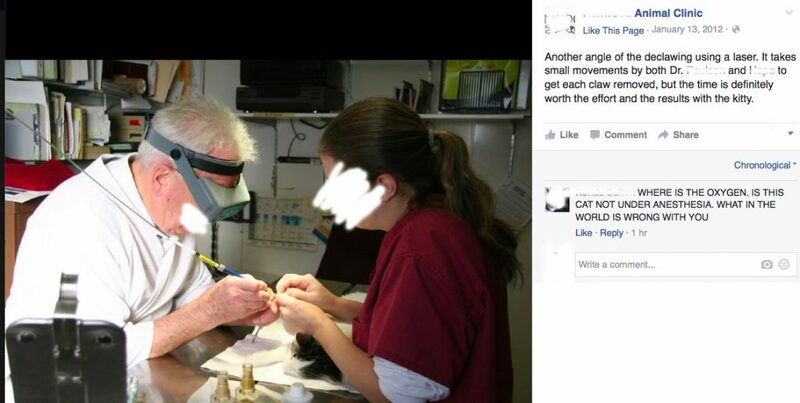 Yet many of these same vets are declawing cats. Don’t you think it’s time for a wake up call for these vets to start putting the welfare of cats on the same level as dogs? Some of the things that I found interesting in this study are as follows. 1) The percentage of cats that are declawed in America hasn’t changed even though there is more education and awareness. 2) When declawing is performed with spay/neuter the cats were more likely to have postoperative complications than were cats that underwent either procedure alone. The AVMA doesn’t want to upset the majority of their 88,000 vet members who declaw kitties so they hold on to these antiquated and outdated myths and completely ignore facts and new studies. Facts that they publish in their own JAVMA. 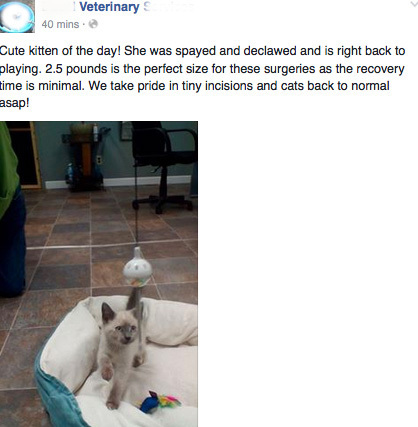 4) Veterinarians and cat owner declaw cats even though it is very painful for the cats. 5) Both long term and short term complications and behavioral issues were confirmed in these studies. 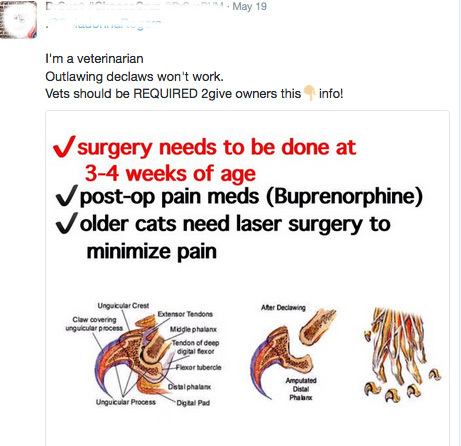 6) There is clear evidence of pain and postoperative complications with declawing no matter how it is performed, with a guillotine nail clipper, laser, and scalpel. Here is the part of the study that involves declawing. all or most of the distal phalanx with a nail clipper. Removal of the distal phalanx with a surgical laser appears to be the quickest procedure and is associated with lower levels of postoperative stress and pain than removal with a scalpel. However, it has also has been associated with a higher number of postoperative complications in the days following the procedure. Transection of the tendons of the deep flexor muscle (ie, tendonectomy) is sometimes performed as an alternative to onychectomy, as it prevents extension of the claws and results in fewer signs of pain. Both onychectomy and tendonectomy should be performed only by veterinarians with appropriate anesthesia and postoperative analgesia. 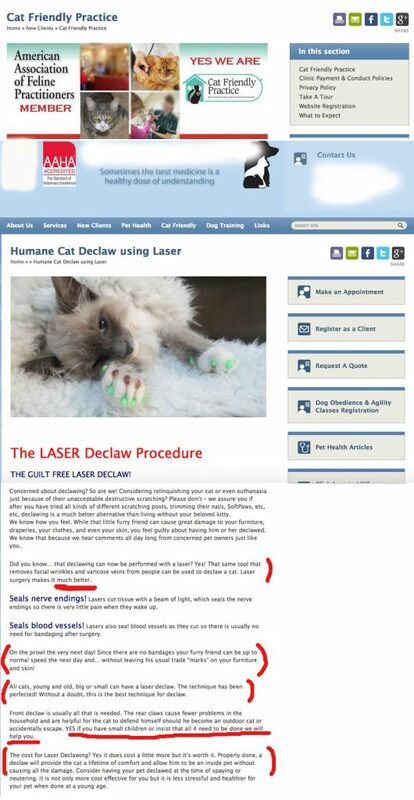 Declawing is usually performed to prevent scratching-related injuries to people and damage to property. Recent surveys of veterinarians indicate that aggression and property destruction due to scratching are frequent behavior problems reported by cat owners. Scratching of people and other animals is undesirable because of the potential for injury and infection, particularly in people who are immuno-compromised. In some cases, this scratching may be intentional and related to aggression, but in others it is unintentional during play and handling. There appears to be a relatively high prevalence of aggression in owned cats, with recent research suggesting 36% of cats display aggression toward their owners and almost 50% of cats display aggression toward either familiar or unfamiliar people. However, although declawing will prevent scratching-related injuries, it is unlikely to resolve the problem of aggression in general owing to the potential for cats to bite as an alternative to scratching. More research is needed to identify means to prevent aggression-related behaviors by cats toward their owners. Scratching items in the environment is a normal behavior that serves a number of functions for cats, including territorial marking and nail conditioning. Farm cats have been reported to scratch between 1 and 6 times a day. Scratching behavior is driven almost entirely by the presence of conspecifics but is still present in cats housed singly in homes. Although it is a normal behavior, environmental scratching is generally deemed to be undesirable by owners because it can lead to property damage. While recent estimates of the prevalence of environmental scratching are unavailable, 2 older studies suggest that 15% to 25% of cats show inappropriate scratching of property, with one of these studies indicating that scratching might increase the risk of cat relinquishment. Although declawing is 1 method of preventing scratching damage, there are alternative methods that do not involve surgery. For example, owners can provide appropriate outlets for scratching and trim their cats’ nails regularly. Therefore, when this procedure is requested, every effort should be made to educate and assist owners of cats to pursue possible alternatives that could alleviate the need for surgery. The National Council for Pet Population has estimated that approximately 14.4 million of the 59 million cats in the United States are declawed. Similarly, a recent study43 reported that 20% of cats admitted in the Raleigh, NC, area had undergone declawing or, more specifically, onychectomy. Interestingly, the percentage of cats that are declawed has apparently not changed in the past decade despite the growing controversy surrounding the procedure. In a survey conducted by Yeon et al, cats reportedly continued to make scratching movements following declawing, but 91% of owners surveyed had an overall positive attitude about the procedure, whether onychectomy or tendonectomy. Various studies have demonstrated that onychectomy causes postoperative pain in cats. discharge. Cloutier et al found that even when cats were treated with butorphanol before surgery, they had evidence of postoperative pain, as determined by comparison with control cats that underwent a sham procedure. 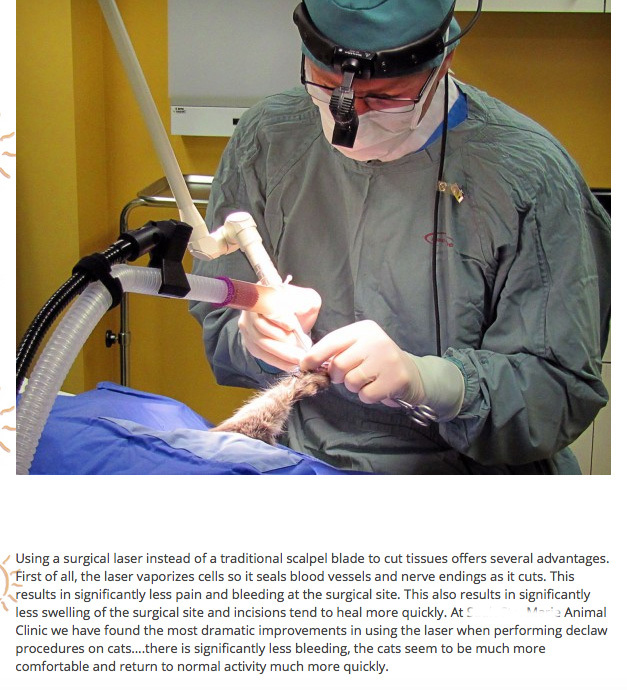 Both of these studies involved removal of the distal phalanx with a scalpel or clipper, but recent studies assessing the effect of laser removal suggest that this procedure also results in postoperative pain, although to a lesser degree than that associated with other methods. Clark et al found that cats that under went laser onychectomy were less reluctant to jump after surgery than were cats in which onychectomy was performed with a scalpel or clipper. Similarly, Holmberg and Brisson compared pain scores during the 10 days following onychectomy with either a scalpel or a laser and found that both groups had elevated pain scores during the first 9 days but that the mean score over the first 7 days was higher for the scalpel group, compared with the laser group. Finally, Robinson et al assessed limb function by measuring ground reaction forces following laser or scalpel onychectomy and found that forces were reduced in both groups following surgery, but the reduction was greater in the scalpel group. 1 study found that tendonectomy resulted in lower pain scores, compared with onychectomy, during the first 24 hours after surgery, another study found no differences in pain scores when comparing the 2 procedures. Jankowski et al reported differences in post-operative complications associated with the 2 procedures. Of 18 cats that underwent onychectomy, 1 had severe postoperative pain and another had long-term lameness. Of 20 cats that underwent tendonectomy, 1 had long-term lameness, but owners of 6 cats expressed dissatisfaction with the procedure because of continued scratching and issues with claw growth and trimming. Although both onychectomy and tendonectomy have the potential to cause acute postoperative pain, it is likely that a multimodal analgesic approach will provide adequate pain control. Although a review of all studies assessing efficacy of analgesic regimens for control of postoperative pain following onychectomy and tendonectomy is beyond the scope of the current discussion, we encourage future research to determine which analgesic regimes are commonly used in current veterinary practice and whether they are sufficient. A number of studies have assessed short-term and long-term postoperative complication rates following onychectomy. Short-term postoperative complications following onychectomy include pain and associated lameness, hemorrhage, swelling, infection, and changes in behavior. Pollari and Bonnett examined the risk of postoperative complications when onychectomy was performed alone or in combination with other surgeries and reported that cats that underwent onychectomy in combination with ovariohysterectomy or castration were more likely to have postoperative complications than were cats that underwent either procedure alone. 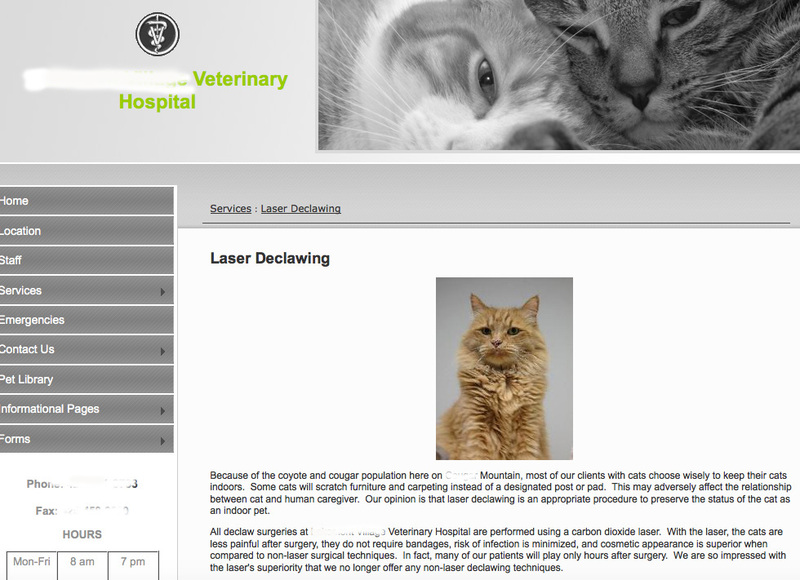 This was particularly concerning because 53% of cats underwent both procedures. and the method of claw removal. (15.4% vs 6.5% and 3.4%). Other long-term complications include persistent lameness and signs of chronic pain. Clark et al reported the highest rates of pain-related complications, with up to 23% of cats having ongoing lameness and 42.3% of cats showing signs of pain on paw palpation. Owners have also reported long-term behavioral changes in cats following onychectomy such as house soiling and an increased resistance to allowing the paws to be handled or an increased incidence or severity of biting, compared with behavior before the procedure. A study of 128 Italian cat owners found that sexually intact male cats were more likely to scratch other surfaces when a scratching post was absent from the environment, and Cozzi et al reported that a feline interdigital semiochemical, a cat pheromone replacement made of fatty acids, can be used to control excess behavioral scratching through placement of this substance on a desired scratching location. Behavior modification methods may also decrease environmental scratching. 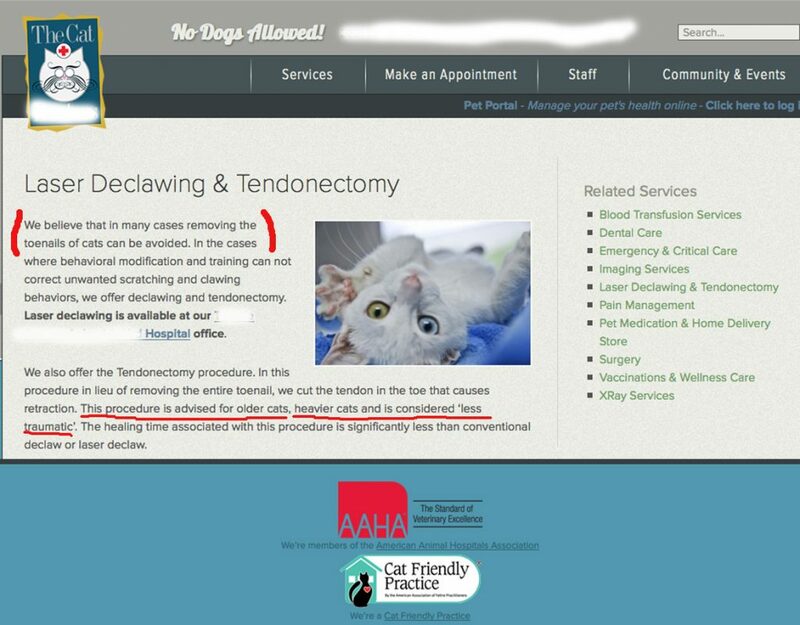 Given clear evidence of pain and postoperative complications with declawing, this procedure should be considered as a last resort after all other behavior modifying measures have been attempted and when the only other alternative is relinquishment or euthanasia. We strongly believe that in a clinical setting, surgical procedures should be performed on animals only if they have or can be expected to have clear benefits for the animal or the population as a whole. At a minimum, the procedures discussed in the present review all cause some degree of acute pain and are associated with some risk of infection or other adverse effects. Society’s attitudes toward dogs and cats have changed over time, likely because of decreased social distance, with the result that attitudes toward certain procedures that were once considered acceptable are now being reconsidered. In many countries, discussions among broad ranges of stakeholders have resulted in legislation banning surgical procedures that are considered elective or unnecessary. that pain. This appears to be true in the case of the procedures discussed in the present review, which are known to be painful but are still commonly performed. We recommend the following strategies for enacting change in Canada and the United States with regards to MUSs in dogs and cats. First, further research and education are needed on effective methods for preventing or treating the underlying behavior problems that traditionally have resulted in declawing, devocalization, and defanging. Second, further research on public attitudes toward MUSs is needed; specifically, understanding the beliefs and values held by the public must be a priority, as only then will it be possible to encourage policy and legislation that accurately reflect the views of current society. Third, veterinarians should take a leadership role in educating both owners and the broader public on the important topic of MUSs in dogs and cats. 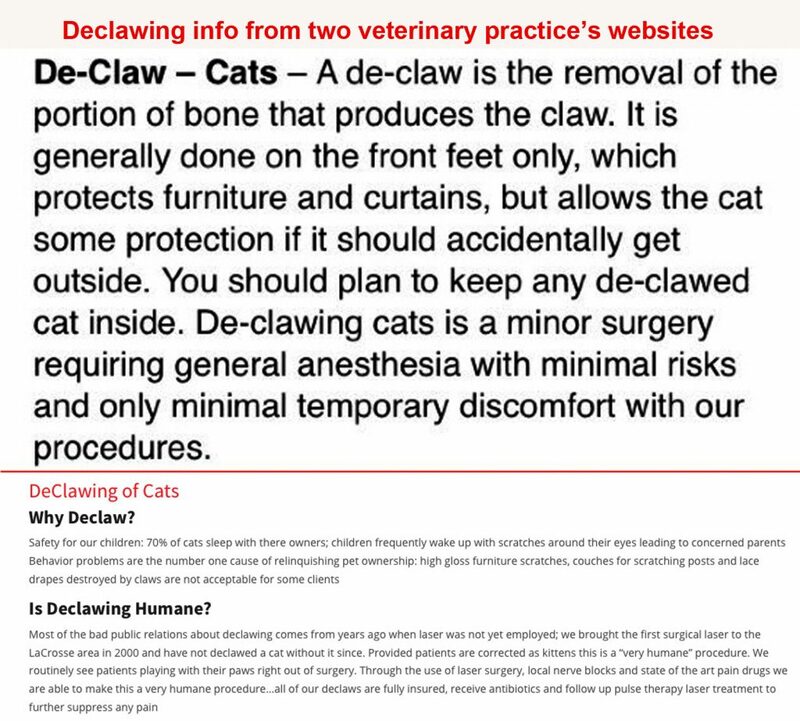 The facts are that the veterinary associations and pro-declaw vets don’t want declawing banned because they say that they are the “licensed professional veterinarians” who know how to make the best medical decisions for their clients and patients. 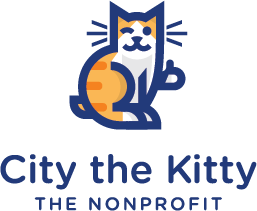 I think we have given them enough time to step up to the plate and show that the educate cat owners and the public about the humane alternatives and also about what declawing really is. In my humble opinion and from all the information that I have gathered in the last 3 years, it is obvious that most pro-declaw vets perform declawing as a first option, don’t counsel clients, or make sure their clients have seriously tried all the humane alternatives that are available. I’ll let you be the judge. Here are just some of the many examples that I’ve found on veterinary practice’s websites or social media pages.